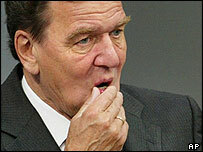 German Chancellor Gerhard Schroeder has announced his resignation as chairman of his centre-left party. "I will concentrate on my work as chancellor and head of government," he told a news conference. The decision comes after mounting criticism in the party of his economic reform agenda and record low ratings. Mr Schroeder named Franz Muentefering, the party's current parliamentary group leader, as the man he would like to succeed him as chairman of the Social Democrats. A special party conference will be held in March to appoint the new leader. The BBC's Ray Furlong in Berlin says Mr Schroeder has never been a particularly popular leader within his party. Mr Schroeder admitted as he announced his decision on Friday that his leadership suffered from communication problems with the party's rank and file. "I think the difficulties we have had in the process of communication justify concentrating our strength in this way," he said. He told a hastily-arranged news conference that Germany was currently in its "most important reform stage since World War II" and he was committed to this process. Mr Muentefering is seen as being closer to the party's left wing and core voters. If appointed, he will have to lead the Social Democrats through a marathon of more than 10 state and local elections this year. Mr Schroeder's "Agenda 2010" reforms, pushed through parliament last year, are particularly unpopular with left-wingers in his party, who say core principles are being betrayed. He had to repeatedly threaten to resign as chancellor last year to quell left-wing revolts in his party. Mr Schroeder says the programme of welfare cuts and labour market reforms is essential to reviving the stagnant German economy and adapting it to an ageing population. The reforms include a new requirement for patients to pay 10 euros (12.50 dollars) per quarter for doctors' visits, which were previously free. Germany's Social Democrats suffered several setbacks in state elections last year. They have also hit an all-time low of about 25% in opinion polls, and lost tens of thousands of members. 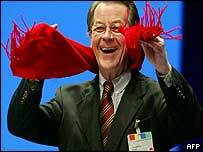 Mr Schroeder first became party leader in 1999, a year after he was elected Chancellor. His great leftist rival, Oskar Lafontaine stepped aside as both chairman and finance minister after losing a power struggle with him.